How much do you want to bet that some people don’t even know this took place on Christmas? 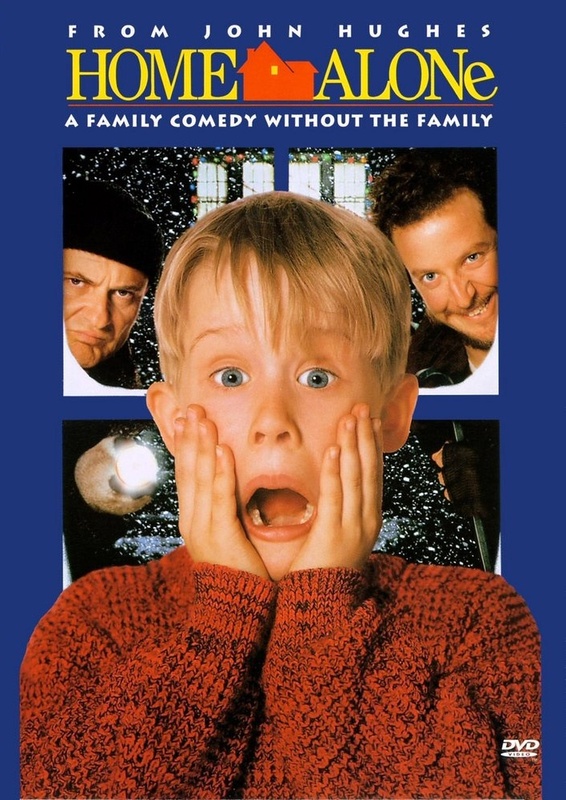 ‘Home Alone’ is the type of movie that down the line is remembered for one aspect so much that it totally overshadows the rest of the film. But as a complete product, what makes the rest of the movie worth remembering? 8 year-old Kevin Mcallister is the figurative whipping boy of his rather large family, all of whom are preparing for a vacation to France over the holidays. No one seems to treat him with an ounce of respect, considering him a nuisance at worst and incompetent at best. A fight between he and one of his siblings gets him sent up to sleep away from the rest of the family. After some pretty on-the-nose foreshadowing, Kevin wakes up the next day to find that his family has taken the trip without him. Totally by accident, of course. Kevin takes advantage of being thoroughly ditched by doing what any little kid in his situation would. Which is basically whatever he wants. All the while, two cat burglars by the name of Harry and Marv pin the Mcallister’s neighborhood as their next target. Practically anyone can tell you that all anyone remembers of this movie is the third act, and it’s for good reason. The movie is pretty consistent with its laughs, but it doesn’t get laugh out loud funny until Kevin and the thieves have their ultimate clash. This type of slapstick would never happen in a family film nowadays, or at least not a live-action one. It’s deadly overkill, extreme to the level that Kevin might’ve just taken up complex serial-killing if he didn’t have better things to do with his time. The sheer violence is really what makes it hilarious, and it’s not something I think can be easily duplicated, as shown by the plethora of movies in the ensuing decade that tried to do so. It’s the kind of lightning in a bottle that really only works because all the right parts are in place. With that said, the non-slapstick humor is also perfectly fine, and overall the tone is both so over the top and so whimsical that it captures what it’s like to be a kid Kevin’s age really well. For no reason whatsoever, you are now picturing this happening to you. You’re welcome. As much as we tend to be naturally cynical towards uber-prolific child stars, there’s a reason Macaulay Culkin became the phenomenon he did. For such a young kid, he does an admirable job practically carrying the whole movie. Kevin’s habit of talking to himself is a bit distracting, but he’s a rather likable and innocent kid all things considered. Also, he makes this face a whole bunch. With his quick sense of humor, ingenious off-the-cuff thinking, and freedom to do whatever he wants, he’s an incredibly effective power fantasy, while still being more than just a cypher. 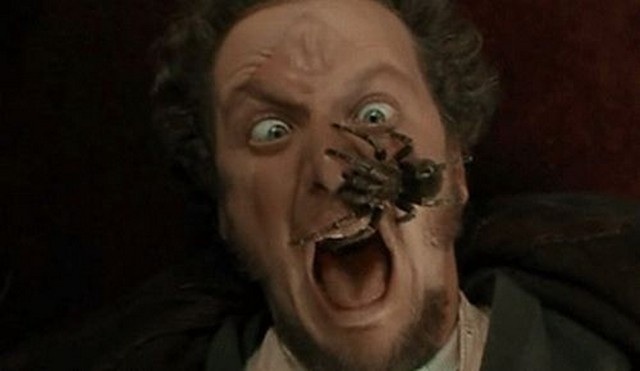 Daniel Stern and Joe Pesci do just as much of the funny work as Kevin’s assailants-turned-victims. Harry and Marv give Tom the Cat a run for his money with how much abuse they take, and even just their dialogue and banter is pretty entertaining. They have a pretty standard “clever one, simple one” dynamic, and though they’re not exactly deep, they’re always fun to watch. Catherine O’Hara is also funny in her own way, playing Kevin’s mom in an almost constant state of panic. The rest of the family (outside of the thoroughly unlikable uncle Frank and the delightfully thick Buzz) are largely just there to service Kevin’s self-sufficiency arc, and while there are a few good lines between them they’re mostly forgettable. The only other major player in the cast is Roberts Blossom as Marley, who serves as a foil to Kevin and ironically learns he value of family from him, as opposed to the other way around. This is an instance where the cast really is centered around solely the main characters. If you don’t like Kevin, Harry or Marv, there’s really no one else to watch for. Outside of the elaborate traps, the biggest thing to note here is John Williams’ score. Williams seems incapable of making a score that isn’t at least somewhat iconic, and ‘Home Alone’ is a perfect example. This is the kind of music that you may recognize instantly without even knowing what film it’s from. Williams’ music is also so distinct from modern film scores that I can’t help but find it all the more unique amongst itself. 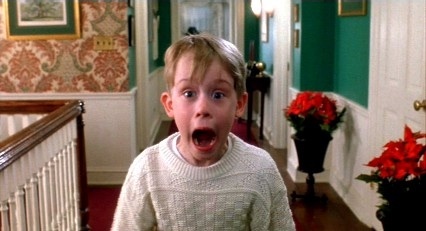 Home Alone is all together a really good film. It’s heartwarming, hilarious, and a perfect watch around Christmas, even if the holiday only ties into the story loosely. With that said, the aspects of this movie that everyone associates with it have that status for good reason, as they are by far the best parts. I can see someone finding the rest of the film unmemorable compared to the climax, though I personally love the whole thing. Posted on December 17, 2014, in Movie Reviews, Other Movies and tagged Christmas. Bookmark the permalink. Leave a comment.